With Readly you can read How It Works Book Of The Elements and thousands of other magazines on your tablet and smartphone. Get access to all with just one subscription. New releases and back issues – all included. 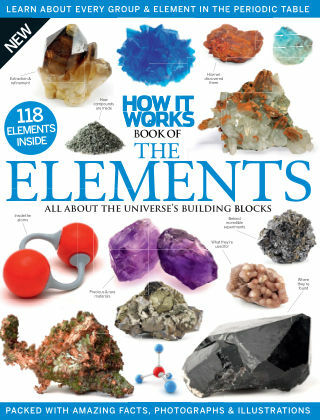 In the How It Works Book of the Elements, we introduce you to the basics of elements and compounds, as well as taking a more in-depth look at the history of key discoveries. Every known element on the planet is covered in detail, from lanthanoids to actinides, alkali metals to transition metals, and halogens to noble gases. You’ll find everything you need to know about the universe’s building blocks right here. Featuring: An introduction to the elements - Electrons, atoms, compounds and much more explained. Elements – a history - Key discoveries and people from the past 400 years. All elements covered - All 118 discovered elements explored. Element information - Atomic numbers, oxidation states, electron configurations and more for each element.